Speech and Hearing Unit The speech and Hearing unit of the Institute operates from Monday to Friday between 09.00am to 05.00pm. It provides speech therapy mainly to the children/persons with speech and hearing impairments. The children/adults with speech and hearing impairments are examined and diagnosed in the assessment clinic and then referred to this unit for hearing assessment and speech therapy services. The speech therapy programme/services are provided to the children who are suffering with cerebral palsy, mental retardation, autism, stammering, articulation disorder etc. in addition to hearing and or speech problem. Elderly persons affected with neurological disorders like CVA, hemiplegia, aphasia, dysphasia, dysarthria are also given speech therapy. The unit also provides the services to the elderly persons with hearing impairment due to ageing. The hearing evaluation or audiometry is done in coordination with the Northern Regional Centre of NIHH (National Institute of Hearing Handicapped) so as to facilitate fitment of hearing aids to the elderly persons. At the early age of life, the hearing problems can be treated and rehabilitated by fitting a hearing aid to hearing impaired person. The organisation is also providing hearing aids to the persons with hearing impairment either by itself or through regional centre of NIHH, free of cost under ADIP Scheme of Government of India. guidance to patients about cleanliness, maintenance, battery replacement, volume control and basic method of operation of hearing aids. The Institute organize distribution and fitment camps in different districts under ADIP Scheme and the patients are provided with hearing aid during these camps. 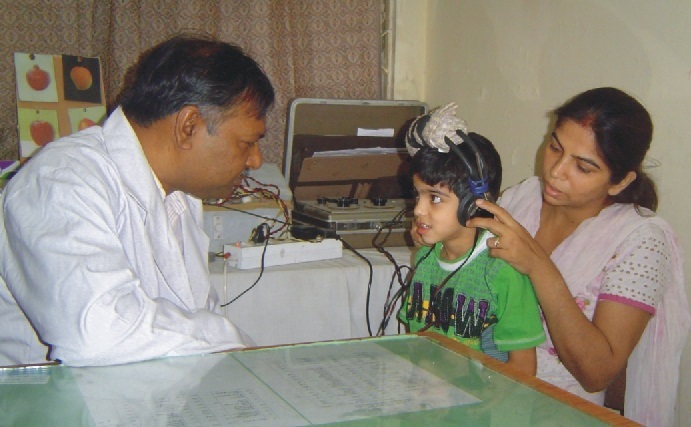 Since there is only one speech therapist in the Institute, the services of regional centre of NIHH in Delhi or locally available audiometrist were also taken during the camps. room will also be constructed in next financial year.